I was so happy to get off the waitlist for "Cress" over my holiday break. The Lunar Chronicles has gotten stuck in my mind, and I can't wait for the the each installment of this impeccable SciFi-fantasy-fairy tale series. This review will necessarily contain spoilers for the first two books, so if you want to avoid them, just know that the series is worth continuing. Everyone who wants to avoid spoilers gone? Good. "Cress" opens with Cress, a young Lunar girl who is stuck on a satellite orbiting Earth. She's been hiding the Lunar ships from Earth's radar's and satellite due to her brilliant programming skills. She's also been closely following the exploits of Cinder in her abundant spare time, even hiding their ship from the Lunars. So when she has the opportunity to reach out to Cinder & crew, she seizes it, and this Rapunzel's rescue is underway. Unsurprisingly, it does not go smoothly. We see our protagonists scattered after the botched rescue, and much of the book is spent on their efforts to reunite. Though it can feel diverted from central plot advancement, Levana's exploits continue & Kai struggles with his choices in the background. Most interesting for me is the exploration of Cinder's development of her gift and her internal conflict over using it. She knows it it's awful to use mind control, yet she finds herself turning to it in times of need. She sees how seductively easy the gift can make achieving her ends. We see her struggle with this, and it's a mature exploration of a complicated theme for a YA book, as I have come to expect from this series. Minor complaints: Cress & Captain Thorne's romance is cute, if a bit predictable. They won me over in the end. Sure, Cress ties into the main group a bit too conveniently, but it's a novel. I'll accept it. Overall, an enjoyable installment, setting me up for the final book. Verdict: Affirmed. If you like this series, don't stop now. 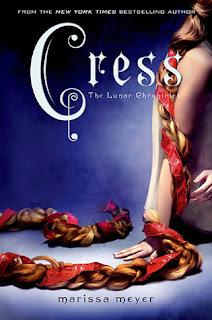 "Cress" by Marissa Meyer, published February 4, 2014 by Feiwel & Friends. Audio narration by Rebecca Soler, published February 4, 2014 by Macmillan Audio.